This recipe is easy, quick, guilt free, tasty and can be made in jiffy isn’t it wonderful? 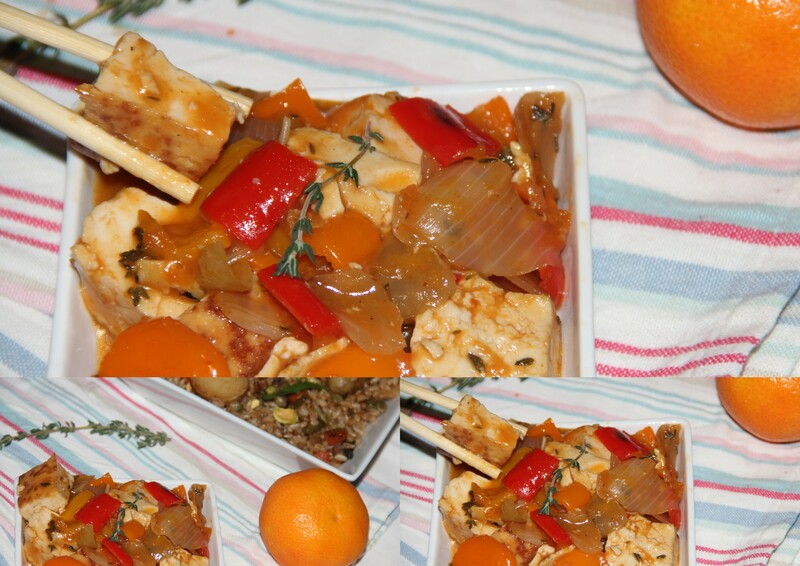 Coming back to this recipe; fresh, juicy orange with sweet & sour sauce along with hint of spicy tomato chilli sauce give this dish a kick. This goes well with any fried rice or noodles or with just plain steamed rice. This dish is composed of one of my most basic Stir Fry or Noodle sauce recipes and a bunch of fresh veggies and tofu. The sauce is extremely simple to make and coats the vegetables and tofu perfectly with the addition of corn starch to help thicken the sauce. I usually serve this stir fry with some Quinoa or brown rice. It’s healthy, easy to make, and tastes great…my type of dish! In a bowl whisk together corn starch, water, soy sauce, vinegar, orange juice, zest and set aside. In a non-stick skillet/pan brush some oil and over medium heat roast/cook tofu for about 4-5 minutes each side or until lightly browned on all sides. Remove from skillet and set aside. Heat oil in a pan over medium heat add garlic, onion and saute for 2-3 minutes. Now add bell peppers and cook for a minute. Then add the corn starch-orange juice mixture, chilli tomato sauce, salt and cook until sauce begins to thicken. Add toasted tofu saute until coated well with the sauce and simmer for a 1-2 minutes. Turn off the flame and stir in fresh thyme. Serve with rice/ flavoured rice. Broccoli/ any other vegetables can be included as a variation. Sauces can be personalised as per the taste. Posted on December 16, 2014, in Dessert, International, Vegan. Bookmark the permalink. 23 Comments. This is like one of my favorite Chinese dishes orange chicken, they also make it with crispy tofu which I love too!! Isn’t orange wonderful it translates well in either savory or sweet dishes. I never get the tofu-frying part just right. Your photo has it looking exactly like I want mine to look. Will follow your recipe to the letter! Yum. Liz – Feels so nice to hear that..
You know I like cooking, so it´s always interesting to pass through your blog and grab some ideas here and there. Thanks for stopping by on my blog earlier. It is a delicious blog that you have, so I follow it now. I do hope you will follow mine back.